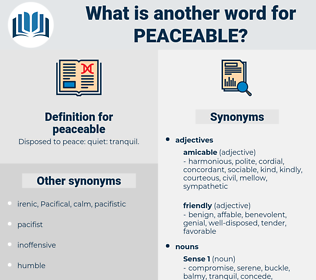 What is another word for peaceable? Disposed to peace: quiet: tranquil. aloof, unreceptive, unsociable, Uncompanionable, incompatible. damaging, malicious, offensive, provocative, harmful. outrageous, immoderate, violent, unlimited, wild, unrestrained, excessive, uncontrolled, unreasonable, extreme. belligerent, cool, mean, unfriendly, cold. 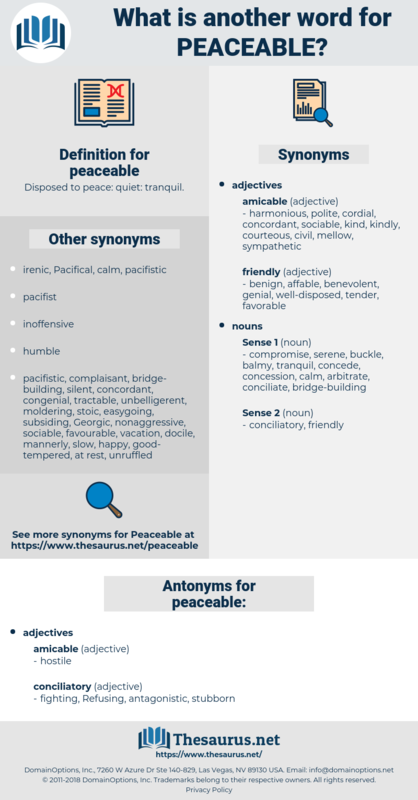 gladiatorial, pugnacious, discordant, assertive, quarrelsome, hot-tempered, militarist, forced, armed, militaristic, hawkish. I claim to be a reasonable man also, and I've had troubles in my time, and now with a family growing up on my hands I'm just as anxious to live peaceable with my fellow - citizens as any man, but I want to say to you that I'm a mean man when you try to drive me. If there 's anybody in there that don't belong in your gang, send 'em out, and we 'll let 'em go away peaceable!